From Lao Cai Train Station, visitor can easily catch a shared car / van to Sapa for VND 60,000 per person (USD1 = VND21,010 as of Nov 2013). The trip takes about 45 minutes. Pay only when you almost reach Sapa. A lot of vans can be seen right after the train reaches Lao Cai. People may follow you and offer “Sapa: 6 Dollars” or “Sapa: 5 Dollars”. 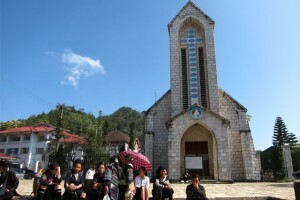 The van may stop near Sapa Church . You can find clean hotels at $6 or less around here with electric heater and hot shower. The hot water is limit (3 liters) and it takes time to boil before you can bath. Make sure you complete your bath before waiting for the second boil. Walking down the Sapa Market, about 5 minutes from the Church, you can find more hotel options from $10-30. It’s dark at night when the market closes, but when you go down the big steps and turn, you will see all the actions. Foods, drinks and convenient stores can be found near the Church or this market area. Visitor can pick a local guide with motorcycle who stands near some visiting places. A return trip to Cat Cat Village costs VND 100,000 per person. A return trip to Ban Hocosts VND200,000 per person. The hotel you stay will call the van back to Lao Cai for you (VND60,000 per person) and it will stop in front of your hotel if you stay in Xuan Vien Street near the Church (in this area you don’t see excellent hotels).